Since quite a while I observe that more and more organizational transformations which try to apply DevOps methods get stuck as they’re focusing too much (or exclusively) on the technical aspects of DevOps. Looking at the famous CALMS model (Culture, Automation, Lean, Measurement, Sharing) those initiatives often focus mainly on automation (e.g. by speeding up their deployment pipeline) and measurement (e.g. by adding monitoring/telemetry capabilities to their services). Don’t get me wrong. Adding automation (or monitoring) capabilities is great! But the point is, sooner or later (mostly later) they realize that they might have implemented the most sophisticated/fast/reliable/… CI/CD pipeline which enables the team to put their stuff out into production within a few minutes, if only the organizational processes would cope with the technical possibilities the team now has. As those organizations often still work in a command and control mode, each change to the productive system must be change-approved by at least one high-payed person, plus they need to file some documents which once more describe the changes they aim to make to their productive system. In short: Processes are too slow, people spend too much time on toil rather than solving real customer problems. Latest at this point they realize that they’ve missed the culture part in DevOps. …Or they just boldly go ahead and tell everyone that this DevOps thing was just overhyped (they knew it from the start, right!?) and it just doesn’t work (in the enterprise world). Changing organizational culture is hard and maybe that’s already the explanation, why it’s easier to focus on automation and monitoring tasks first. Changing culture is the not manageable part of a DevOps transition. You need to work with humans who potentially need to change their habits, which they’ve cultivated over years or even decades. Habits which work for them. Habits which brought them into their respected position they are now in. So the question is how do we get there? How do we transform our organization’s culture so that it is aligned with the challenges of today’s businesses? This is where trust comes in as an enabler for your cultural DevOps transformation. performance as they neither were involved in its decision nor in the actions that resulted from that. Organizations that work without trust, essentially burn money. They hire smart people, pay them high wages but are not able to leverage the full potential of their complete workforce. There is another reason, why organizations that don’t foster trust, burn money. In my example above, I described a team that fully automated their CI/CD pipeline, enabling them to do deployments super-easy and super-fast. Unfortunately, due to their organization’s culture they are not allowed to make any changes to their productive system without satisfying some kind of control process, which completely vanishes the improvements in speed and simplification that the high degree of automation brought them. Decision workflows that neither add value to the product nor to the customer. Often, higher-payed persons are involved in these workflows, where the primary reason for involving these persons is of informative type. Trying to automate the formal procedures from flavor one, is often seen as a mitigation to the problem. However, this requires time and resources while it’s often bound to high maintenance costs, keeping the forms and processes in sync. The second flavor given above, can only be adressed with by simplifying or discarding the decision workflow, making information flow easier and faster. 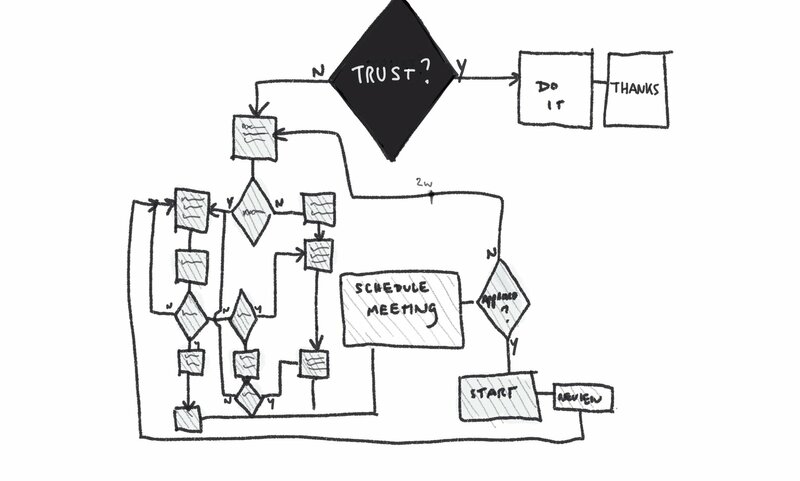 Making decisions faster is one of the fundamental reasons why organizations should foster trust. gives great insights and examples on how trust accelerates decision making. New technologies accelerate our daily businesses. Organizations must be able to perform faster to leverage the possibilities those new technologies offer, or these organizations will become obsolete. Before we look into the details on how trust can be fostered in an organization, we first need to understand what trust is. Remember the first time you entered a plane? Chances are high that you felt a bit nervous and you were not quite sure whether you should have trust in a safe travel. You could say your trust account on aviation was 0 and it needed to be loaded first. Every successful flight you take, pays in to your aviation trust account, so that you gain more and more trust in flying. However even if all your past experiences in flying were positive, you might still not feel trust when you enter a plane, as you also need to perceive competence. If you think the plane’s crew is not able to fly the plane, you won’t have trust in a safe travel, no matter how many times before everything went well. If all your past experiences of flying were positive and you perceive the plane’s crew as competent flying a plane, you might still not trust the crew if you have doubts on their good intentions. Having trust defined, we’ll now see how trust could be cultivated in an organization. Based on my observations from various occasions, I think the following three elements can help fostering trust in an organization. The size of a team or organization plays an important role, as good and effective communication is important to gain trust. “Adding manpower to a late software project makes it later.” – Fred P. Brooks Jr.
What seems mythical, but so well known to people in the software industry, is the result of ineffective and bad communication, according to Brooks. The more people need to communicate, on e.g. one software component, the more time the communication will take, making it likewise less effective. The question, is what is a good max. size of a team or organization so it’s communication is still effective and trustful? The smallest tactical unit of the roman army was the “maniple”, literally meaning “a handful”, which had a max. size of 150. The hutterites – a religious group living in so called “Bruderhof” Communities in northern America – split their communities once they constantly exceed 150 persons. The company that produces the waterproof, breathable membrane Gore Tex splits their organization at the size of about 150 employees, to prevent bureaucracy and hierarchies. Interesting here is the 15 trusted friends, as we’re seeking for an ideal size of trustful groups. 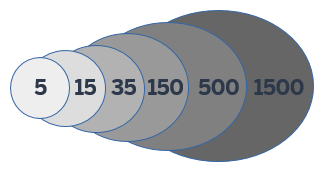 An optimal team size should not vastly exceed 15 persons, which is pretty in-line with the common practice to create teams of ten or two pizza teams. Important here is to understand the implications that a large team or a large organization has. It does not mean that you need to cut each organization down to 150 employees and each team down to 15 persons to be successful. Simply knowing the above-named effects on team communication and team trust helps to create trustful organizations. Collocation is an important trust enabler for teams. Every human is a social being and people seek personal interaction with one another. If you ever had an evening beer with your team mates you know what I’m talking about. Putting team mates miles and miles apart does not only block this pursuit for social interaction, it also fosters group separation. Henri Tajfel, a social psychologist, worked on theories on social groups. How is a social group created? How and why do people feel involved in groups? One of his findings became known as the minimal group paradigm. Tajfels experiments, which have been repeated over and over again, revealed that meaningless distinctions between groups, such as preferences for certain paintings or the color of their shirts can trigger a tendency to favor one’s own group at the expense of others. 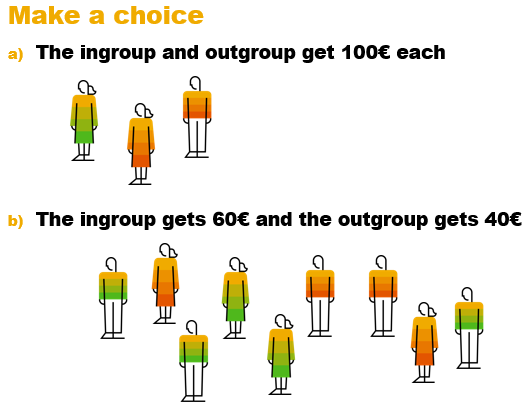 The vast majority of people will choose option b), which favours the own group even if that means their own group get less overall. Imagine what happens if you put a team or organization which must work together miles and miles apart. Not only the communication will be distracted and the social interaction is blocked, but also you foster a separation of the people as they start creating their own social groups, which excludes “the others” (the people in “the other location”). It’s the source of all “They vs. Us” conflicts in separated teams. One solution for this, is creating collocated teams, consisting of people that must work together. Avoid any segregation of duties across locations. Each team or organization in one location should work autonomous, and should be empowered to make its own decision. Empowered teams are often diverse and heterogeneous, as you need the skills of everyone to fully make use of the team’s potential. Basically, every successful team is heterogeneous. Think a second about successful teams! People must feel psychological safety to establish trust. If they are afraid of any kind of punishment from another person, it’ll be hard for them to create any trustful relationship. 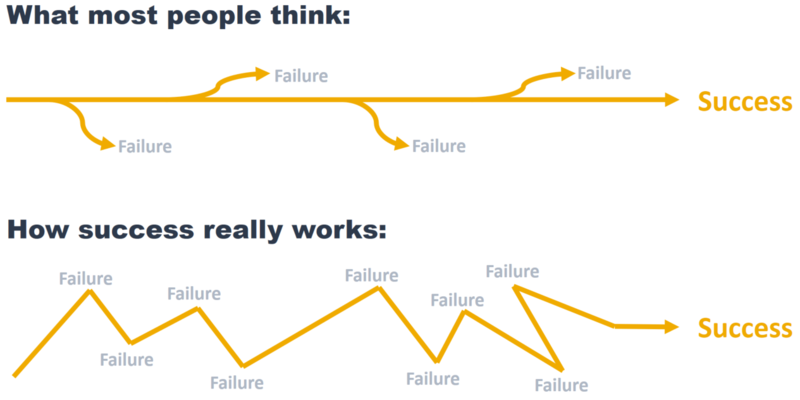 People must experience that it’s ok to fail and that failure is part of any learning process. To succeed it’s necessary to make failures from which one can learn. Creating a learning environment, is a key skill for team and/or organization leaders. Thomas J. Watson was the first CEO of IBM, and in the early years, the company was involved in a 10 million dollar business opportunity, which was one of the largest potential deals for them at that time. They assigned a new hired sales representative on that opportunity, and on one of his first days, he ruined the opportunity, so the potential deal was all gone. 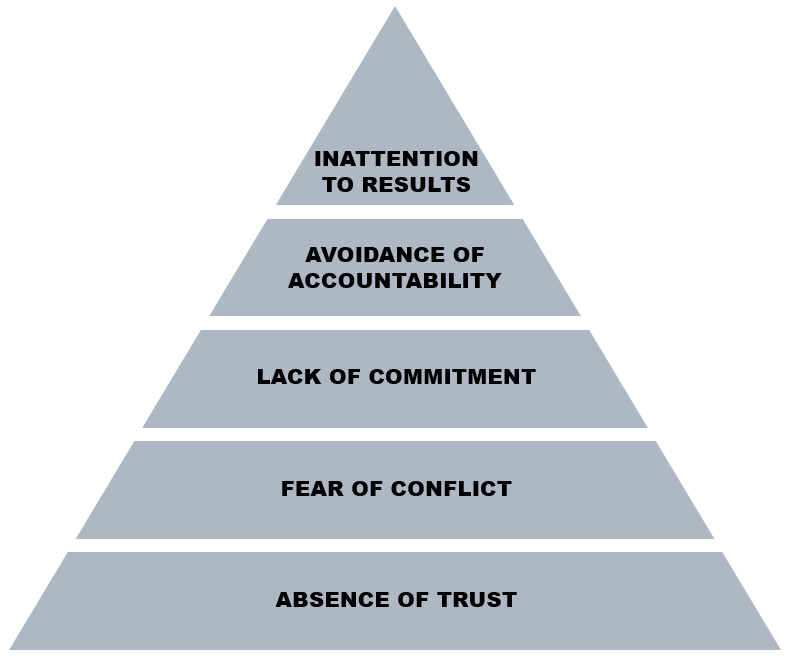 Leaders can create an environment of psychological safety better than most other people in an organization. How important psychological safety is, was also shown 2012 in a Google team research project (“Project Aristotle“). Aim of the research was to find out why some teams at Google stumbled while others soared. After investigating all kinds of team parameters, the researchers accidently found out that psychological safety was more critical than any other parameter to make teams successful. The research also revealed that psychological safety can be fostered by showing personal vulnerability. The more vulnerable a person appears to another, the more likely the other person will feel psychological safety. Tell people that you struggle, that you need help, that you don’t know. Statements like these help to create trustful relations in your team or organization. DevOps transformations require cultural awareness and an organization based on trust. The above given motivations, as well as the proposals on how to foster trust will hopefully help you in your DevOps journey. If you’re further interested in the above given topic, please see my Keynote from DevOpsDays Kiel 2018, on exactly this topic. Together with his former team “TwoGo by SAP” he established the first Continuous Delivery implementation at SAP, delivering value daily to their customers. We have taken all measures possible to make this post as accurate as possible but things sometimes fall through the cracks. In case you find any errors or inconsistencies please let us know.